Red Queen Casino has now added slots from High5 Games – find out which titles are now available and what they have to offer you. 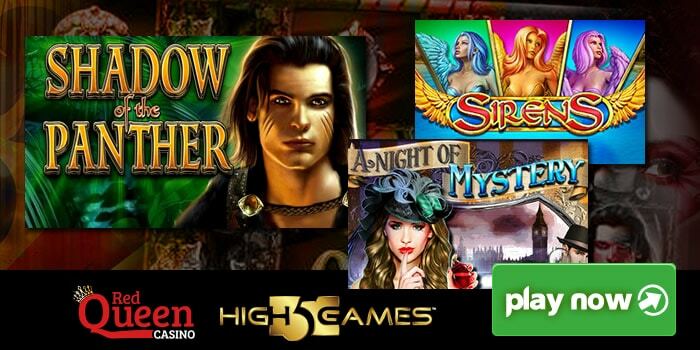 9 titles from High5 Games are now available at Red Queen Casino – these include A Night of Mystery, Golden Knight, Gypsy, Michelangelo, Shadow of the Panther, Sirens, The Mighty Atlas, Valkyrie Queen and Vivaldi’s Seasons. This will complement their existing offering of slots from NextGen Gaming, Thunderkick, ELK Studios and Playson – the latter is available exclusively to Red Queen Casino. As mentioned, Red Queen Casino has added 9 games from High5 Games – my favourite is the volatile Sirens which has 5 reels and 30 paylines and playable from 30p a spin. With a Greek mythology theme, it benefits from stacked symbols and a Free Spins feature where you can get up to 15 free spins – once the free spins play out, choose a harp to reveal a multiplier of up to 10x which is then applied to your wins! Then you have Shadow of the Panther which is a popular land based slot with 5 reels and 30 paylines. Set in the jungle and with a cat theme, the game benefits from split symbols with 10 symbol winning combinations possible. There are also super stacked symbols to win big from. It also has a Free Games Bonus feature where you will get up to 15 free spins and hopefully get big rewards with the split symbols and super stacks. Finally, I recommend A Night of Mystery which has a Victorian detective theme and has 5 reels and 40 paylines. There are stacked symbols and a Clue Collections Bonus feature where you will begin with 9 free spins. Collecting clues will turn symbols into sticky wilds – collecting clues can also give you extra free spins with up to 21 in total available. Why play at Red Queen Casino? New UK players can get a £10 no deposit bonus for signing up – register and you’ll get a text message within 10 minutes with a 3-digit code – enter this code to get £10 completely free. There is also a superb welcome bonus package with 3 deposit bonus offers – the first is 150% up to £150 (i.e. deposit £100, get £150 free), the second is 100% up to £200 and the third being 50% up to £250.